The Osney Mead Industrial Estate is a largely under-utilised, 44-acre site in an important area of Oxford just west of the city centre off the Botley Road. It comprises a large number of low intensity industrial buildings, in poor condition and nearing the end of their useful economic life. 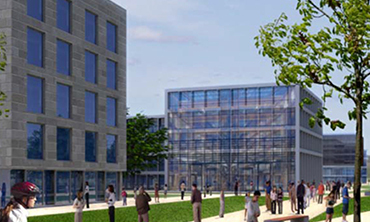 As one of the principal landowners, the University, in partnership with other stakeholders, has developed a comprehensive vision for the site to help unlock its potential and bring economic benefits to the city and the region. The masterplan looks at regenerating the whole site to become a vibrant innovation quarter, providing increased opportunities for employment, homes and supporting uses, and better pedestrian and cycle connections to the City centre and surrounding areas. It envisages a transformation of Osney Mead into a pleasant waterside place, with new publicly accessible outdoor spaces, improved landscapes, and reduced risk of flooding. Our vision for Osney Mead has been developed and submitted in support of Oxford City Council’s local plan review. We held a public consultation event in July 2016 to ask local residents and stakeholders to identify key issues that need to be addressed in taking the proposals forward. We are now working with the Environment Agency to reduce the flood risk in the area. In early 2018, the Oxford Flood Alleviation Scheme reached its target funding and has submitted a planning application to deliver the scheme. We are also working with other partners, including the Environment Agency, Oxford City and Oxford County Councils, OxWed (Oxford West End Developments) and Network Rail, to improve access from the east of the site to the city centre. Further public consultations will take place as our plans develop and the speed of implementation will depend on a wide range of factors, including future trends in research, innovation and scientific development, and the availability of funding. The first phase of development is likely to include housing for University staff and graduate students.